Sodium is a vital nutrient that plays an important role in the hydration level of the body and contributes to the acid-base balance as well as the transmission of nerve impulses and muscle contraction. Certain people, such as athletes, have higher than average sodium requirements to replace losses due to sweat. In general, the recommended amount of sodium per day is 1500 milligrams, which equates to only ⅔ of a teaspoon of table salt! Canadians consume an average of 2760 milligrams every day, almost double the recommended daily intake. 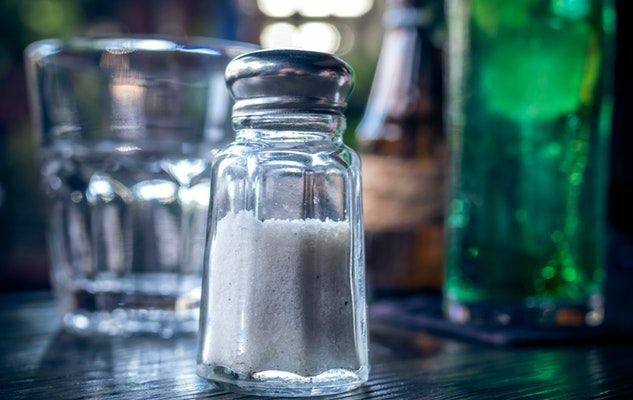 While eliminating the salt shaker can be helpful, it is in fact not enough, since 77% of Canadians’ sodium intake actually comes from processed foods! The main sources are bread and other bakery products such as muffins, biscuits, crackers and cereal bars, mixed dishes such as pizza, lasagna and frozen dishes, and processed meats such as sausages, cold cuts and chicken wings. Limit your purchase of processed foods and restaurant meals and instead cook more at home with fresh ingredients. Meal plans are available to help if you run out of ideas or need help planning your meals. When choosing packaged products, read the labels to make sure you are choosing a product that is low in sodium. Opt for a product that contains less than 200 mg of sodium (i.e. 8% and less), and if possible less than 115 mg of sodium (5% and less). Health Canada has introduced draft regulations which would require a symbol to appear on the front of food packages containing large amounts of sodium, sugar and saturated fats, which should make it easier for consumers to read labels and should encourage manufacturers to reduce the sodium content of foods. Even if a food has a high sodium content, your sodium intake depends on the portion you consume. So, opt for a smaller portion of processed food when you can. For example, instead of eating three slices of pizza, eat only one slice and accompany it with a salad and homemade salad dressing. Finally, while limiting sodium intake is important, increasing one’s level of physical activity and eating a diet rich in fruits and vegetables are other lifestyle habits that can also greatly contribute to reducing the risk of cardiovascular disease.